Catarina was an incredible tour guide. 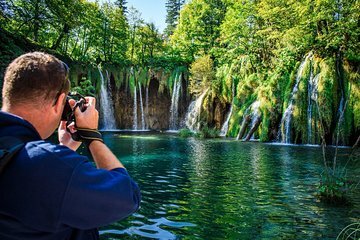 She is extremely knowledgable and talented, and definitely manages a large group of people very well something that's not always easy to do, especially in a place crowded with tourists, like the Plitvice Lakes in August. She is very accommodating. I would definitely recommend this tour in one of the most beautiful parts of Croatia. It was my favorite day of the 2 weeks I spent in Croatia. This was a fantastic tour, even though it rained most of the day it was still an enjoyable trip. The park is amazing and our guide was really informative and fun. Totally recommend this tour to anyone visiting Croatia. The place is stunning, but the crowds along the narrow boardwalks required us to keep shuffling along, taking a quick picture to not hold up the line. The best advice is go in April may time frame and go early in the morning to see all of the park. Our tour was a half day and we only saw 1/3 of it, but it was still amazing. We took this tour on rainy day of September, wheather wasn't of the best. Also trails through park were slippery, so You should wear comfortable shoes and grab a raincoat, if you're travelling in autumn. But the park itself is very beautiful, a lot of waterfalls on every corner. We took a boat ride from one route to another. Probably looks better on sunny day, but we enjoyed it anyway. Worth to visit. Absolutely fabulous Park - even on a rainy day as we had. I can only imagine the colours of the lakes if there is a bit of sunshine! Even in cloud, they have gorgeous jewel colours of jade and turquoise and the water was crystal clear. The guides were informative and looked out for everyone. However, I felt a little rushed at times and would have liked a little more time to take photos. The most time was allocated to the biggest waterfall which was not at all the most picturesque. I much preferred the Milka waterfall which we saw earlier in the tour and I felt warranted a bit more time. The hike is quite challenging for anyone with any mobility issues and a reasonable level of fitness is needed to get around the park. All in all, it definitely worth taking a guided tour, if for no other reason than to avoid the long queues even on a wet day in September!. I have no hesitation in recommending this tour to anyone. 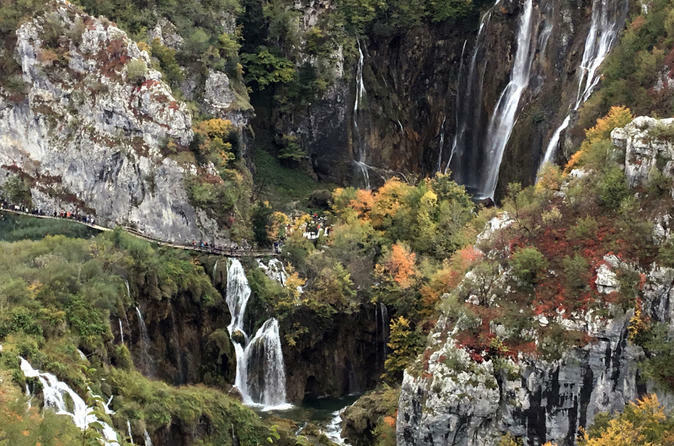 The Plitvice lakes are truly wonderful and the tour was great. Only suggestion would be avoid peak holiday season as it was overwhelming re the number of people given many of the walking tracks are narrow. This is a must-see in Croatia, of course. We had a very nice guide, Marina, who had a great sense of humor and tried her best to keep us entertained and happy. The tour was well organized, very punctual and the coach was comfortable. They provided us with plastic ponchos because of the rain super nice! and the lakes are breathtaking. The waterfalls were a bit disappointing but later I learned drought season was just over so the timing wasn't the best. I am glad I went and saw the lakes, however because of the weather the experience wasn't the best or not nearly as close as I expected. It was pouring down on the day of our tour, so when we were halfway on our walk everybody was bored, tired, upset, soaking wet and cold early September, still summer though.The paths in the park are narrow and became very slippery with the rain, there are lots of steps up down as well, you have to watch out where you place your feet and the amount of people coming and going does not make the walk any easier. You have to focus very hard on your steps and end up missing the landscape around you, because the group doesn't stop and the walk is not in a contemplative pace I thought it was kind of in rush really, but that might be because of the rain that got heavier and heavier. I recommend the tour but I'd keep an eye on the weather forecast and prepare well for it, bearing in mind that it might steal part of the beauty of the tour. Plitvice Lakes National Park was beautiful but apart from shuttling us from Zadar to Plitvice and back the tour didn't really provide any value. No lunch or entry fee was included and the tour guide information provided was basic. There is no need for a guide to navigate as it's impossible to get lost. I should have saved my money and go on my own. Worth the trip from Zadar!